“When will Salty Dog have its day?” So asked Alan White of Berwick-upon-Tweed in the July 26th 1969 issue of Melody Maker. The letter is reproduced within the lush packaging of Fly Records and Salvo’s latest Procol Harum reissue, the masterful A Salty Dog. If ever a band were a victim of their own good fortune then Procol Harum was it. Such was the shadow cast by the phenomenal success of 1967’s A Whiter Shade of Pale that the band was fated to be remembered as the one-hit wonders responsible for that song. But Procol Harum were an album band, hugely influential amongst their peers and noted pioneers in progressive rock. Even so, the succession of albums released in the aftermath of A Whiter Shade of Pale slipped beneath the radar, largely ignored by a record-buying public in the throes of Pale-induced denial. 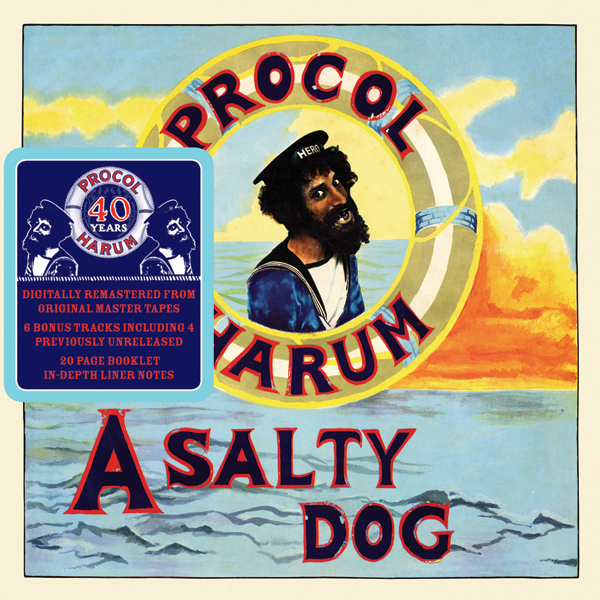 A Salty Dog was Procol Harum’s third album release, hitting UK stores in June of 1969, a whole two years after A Whiter Shade of Pale had taken the number one spot. Almost as if to honour this, it became their first long-player to make a dent on the Albums Chart, reaching Number 27 in July of that year. Pretty much universally acknowledged as being their masterpiece – and I’m not going to argue with that – A Salty Dog takes what had gone before, scrubs down its deck, hoists its mainsail and splices the mainbrace in celebration, leaving the moments of jetsam that occasionally surfaced on Procol Harum and Shine on Brightly, drifting in its wake. With Brooker and Reid finding perfection in their songwriting partnership and Hammond maestro Matthew Fisher taking on production duties, it kicks off with the title track, a progressive rock magnum opus condensed into four-and-a-half minutes of wistfully mounting, melancholic pleasure. In leading with A Salty Dog they set themselves the almost impossible task of having to follow it. Nevertheless this album, based very loosely around a nautical concept, rises nobly to the occasion, successfully blending grinding blues riffs, classical elements and the ever-present sonic soup of Fisher’s Hammond organ and Gary Brooker’s piano, into one admirable whole. And in doing so it offers up plenty worthy of recommendation, including Robin Trower’s guitar workouts on the throbbing Honky-Tonk of The Milk of Human Kindness, the ghostly lament of Pilgrim’s Progress and the quirky, marimba-boasting Boredom. As with the other Procol reissues, Fly once again come up with the goods by way of bonus tracks. There’s the B-side to the original single release of A Salty Dog – Long Gone Geek; a raw, instrumental take of The Milk of Human Kindness, and four live tracks recorded Stateside in April of 1969. The packaging, booklet, liner notes and rare photographs are all up to the exceptionally high standard set by the previous Fly and Salvo reissues, complimenting [sic] an already stately release. In 1969 A Salty Dog was Procol Harum’s most ambitious venture to date and one that blazed the trail for many to follow. If we gave star ratings at Head Full of Snow, it would undoubtedly get the full-fat five. As we don’t, take that as all the recommendation you need. I’m sure Mr White of Berwick-upon-Tweed would agree.